This paper explores how assigning software developers the identity of “engineers” metes out specific assumptions about IT projects. 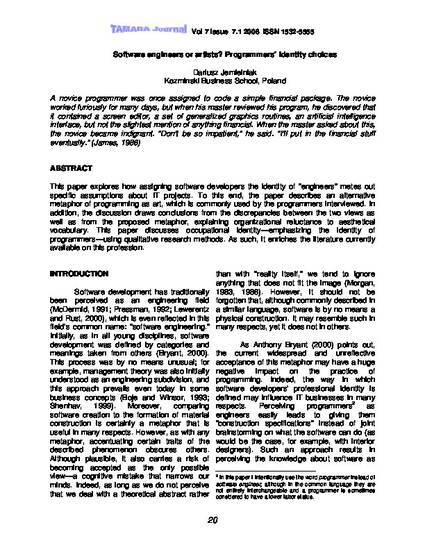 To this end, the paper describes an alternative metaphor of programming as art, which is commonly used by the programmers interviewed. In addition, the discussion draws conclusions from the discrepancies between the two views as well as from the proposed metaphor, explaining organizational reluctance to aesthetical vocabulary. This paper discusses occupational identity—emphasizing the identity of programmers—using qualitative research methods. As such, it enriches the literature currently available on this profession.